After months of preparing for the most technically sophisticated and challenging occultation campaign in history, it’s all coming down to the wild card – will there be clear skies? Go behind the scenes with New Horizons scientists “chasing” the shadow of the mission’s next flyby target across two continents, South America and Africa. Two seconds could change everything we know about a Kuiper Belt object known as 2014 MU69, a mysterious remnant of early solar system formation. The planned search will involve targeting a small area of sky in search of a Kuiper Belt object (KBO) for the outbound spacecraft to visit. The Kuiper Belt is a vast debris field of icy bodies left over from the solar system’s formation 4.6 billion years ago. A KBO has never been seen up close because the belt is so far from the sun, stretching out to a distance of 5 billion miles into a never-before-visited frontier of the solar system. “I am pleased that our science peer-review process arrived at a consensus as to how to effectively use Hubble’s unique capabilities to support the science goals of the New Horizons mission,” said Matt Mountain, director of the Space Telescope Science Institute (STScI) in Baltimore, Maryland. Fully carrying out the KBO search is contingent on the results from a pilot observation using Hubble data. If the test observation identifies at least two KBOs of a specified brightness it will demonstrate statistically that Hubble has a chance of finding an appropriate KBO for New Horizons to visit. At that point, an additional allotment of observing time will continue the search across a field of view roughly the angular size of the full moon. Astronomers around the world apply for observing time on the Hubble Space Telescope. Competition for time on the telescope is extremely intense and the requested observing time significantly exceeds the observing time available in a given year. Proposals must address significant astronomical questions that can only be addressed with Hubble’s unique capabilities, and are beyond the capabilities of ground-based telescopes. The proposals are peer reviewed annually by an expert committee, which looks for the best possible science that can be conducted by Hubble and recommends to the Space Telescope Science Institute director a balanced program of small, medium, and large investigations. Though Hubble is powerful enough to see galaxies near the horizon of the universe, finding a KBO is a challenging needle-in-haystack search. A typical KBO along the New Horizons trajectory may be no larger than Manhattan Island and as black as charcoal. Even before the launch of New Horizons in 2006, Hubble has provided consistent support for this edge-of-the-solar system mission. Hubble was used to discover four small moons orbiting Pluto and its binary companion object Charon, providing new targets to enhance the mission’s scientific return. And Hubble has provided the most sensitive search yet for potentially hazardous dust rings around the Pluto. Hubble also has made a detailed map of the dwarf planet’s surface, which astronomers are using to plan New Horizon’s close-up reconnaissance photos. In addition to Pluto exploration, recent Hubble solar system observations have discovered a new satellite around Neptune, probed the magnetospheres of the gas-giant planets, found circumstantial evidence for oceans on Europa, and uncovered several bizarre cases of asteroids disintegrating before our eyes. Hubble has supported numerous NASA Mars missions by monitoring the Red Planet’s seasonal atmospheric changes. Hubble has made complementary observations in support of the Dawn asteroid mission, and comet flybys. In July 1994, Hubble documented the never-before-seen string of comet collisions with Jupiter that resulted from the tidal breakup of comet Shoemaker-Levy 9. New Horizons should perform a flyby of the Pluto system on 14 July 2015. On New Year’s Day 2019, more than 4 billion miles from home, NASA’s New Horizons spacecraft will race past a small Kuiper Belt object known as 2014 MU69 – making this rocky remnant of planetary formation the farthest object ever encountered by any spacecraft. 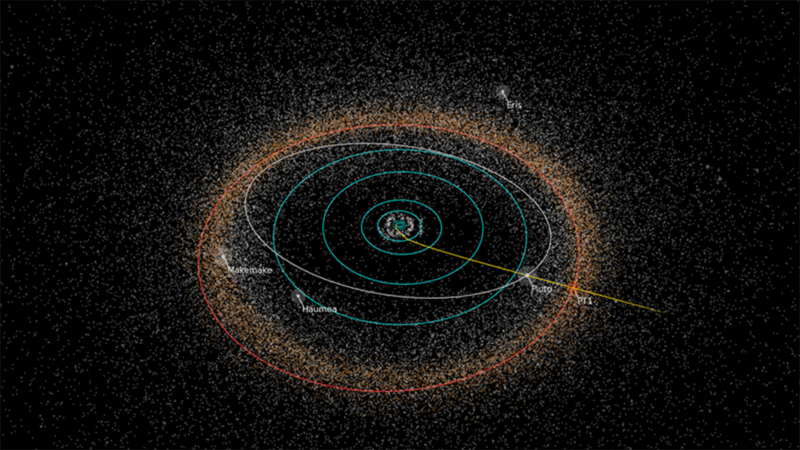 Path of NASA’s New Horizons spacecraft toward its next potential target, the Kuiper Belt object 2014 MU69, nicknamed “PT1” (for “Potential Target 1”) by the New Horizons team. 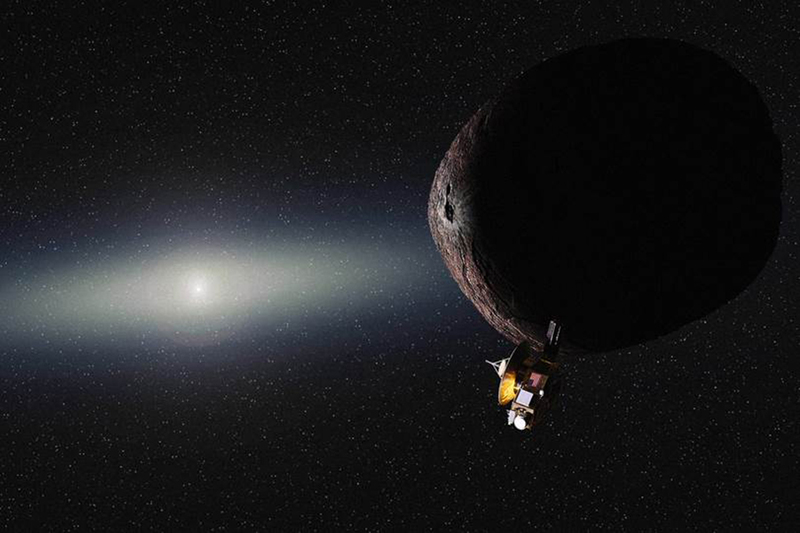 NASA must approve any New Horizons extended mission to explore a KBO. Credits: NASA/JHUAPL/SwRI/Alex Parker. But over the next six weeks, the New Horizons mission team gets an “MU69” preview of sorts – and a chance to gather some critical encounter-planning information – with a rare look at their target object from Earth. On June 3, and then again on July 10 and July 17, MU69 will occult – or block the light from – three different stars, one on each date. To observe the June 3 “stellar occultation,” more than 50 team members and collaborators are deploying along projected viewing paths in Argentina and South Africa. They’ll fix camera-equipped portable telescopes on the occultation star and watch for changes in its light that can tell them much about MU69 itself. The team will have no such luxury with the MU69 occultations. Marc Buie, the New Horizons co-investigator from SwRI who is leading the occultation observations, said that because MU69 is so small – thought to be about 25 miles (40 kilometers) across – the occultations should only last about two seconds. But scientists can learn a lot from even that, and observations from several telescopes that see different parts of the shadow can reveal information about an object’s shape as well as its brightness. New Horizons team members prepare one of the new 16-inch telescopes for deployment to occultation observation sites in Argentina and South Africa. Credits: Kerri Beisser. The mission team has 22 new, portable 16-inch (40-centimeter) telescopes at the ready, along with three other portables and over two-dozen fixed-base telescopes that will be located along the occultation path through Argentina and South Africa. But deciding exactly where to place them was a challenge. This particular Kuiper Belt object was discovered just three years ago, so its orbit is still largely unknown. The team used star-position data from the extensive catalog of the European Space Agency’s Gaia mission and Hubble Space Telescope position measurements of MU69 to predict the narrow occultation path. But without a precise fix on the object’s position – or on the exact path its narrow shadow might take across Earth – the team is spacing the telescope teams along “picket fence lines,” one every 6 to 18 miles (10 or 25 kilometers), to increase the odds that at least one or more of the portable telescopes will catch the center of the event and help determine the size of MU69. The other telescopes will provide multiple probes for debris that could be a danger to the fast-moving New Horizons spacecraft when it flies by MU69 at about 35,000 miles per hour (56,000 kilometers per hour), on Jan. 1, 2019. The team gets help from above for the July 10 occultation, adding the powerful 100-inch (2.5-meter) telescope on NASA’s airborne Stratospheric Observatory for Infrared Astronomy (SOFIA). Enlisting SOFIA, with its vantage point above the clouds, takes the bad weather factor out of the picture. The plane also should be able to improve its measurements by maneuvering into the very center of the occultation shadow. This continues a history of coordination between SOFIA and New Horizons missions. Researchers used SOFIA to make similar observations of Pluto as it passed in front of a background star, just before New Horizons flew past Pluto in 2015. If weather cooperates and predicted targeting proves on track, the upcoming occultation observations could provide the first precise size and reflectivity measurements of MU69. These figures will be key to planning the flyby itself – knowing the size of the object and the reflectivity of its surface, for example, helps the team set exposure times on the spacecraft’s cameras and spectrometers. Follow the observations in Argentina, South Africa and on board SOFIA on Facebook and Twitter using #mu69occ. The New Horizons mission is helping us understand worlds at the edge of our solar system by making the first reconnaissance of the dwarf planet Pluto and by venturing deeper into the distant, mysterious Kuiper Belt – a relic of solar system formation. New Horizons launched on Jan. 19, 2006; it swung past Jupiter for a gravity boost and scientific studies in February 2007, and conducted a six-month-long reconnaissance flyby study of Pluto and its moons in summer 2015, culminating with Pluto closest approach on July 14, 2015. As part of an extended mission, pending NASA approval, the spacecraft is expected to head farther into the Kuiper Belt to examine another of the ancient, icy mini-worlds in that vast region, at least a billion miles beyond Neptune’s orbit. Sending a spacecraft on this long journey is helping us to answer basic questions about the surface properties, geology, interior makeup and atmospheres on these bodies. The National Academy of Sciences has ranked the exploration of the Kuiper Belt – including Pluto – of the highest priority for solar system exploration. Generally, New Horizons seeks to understand where Pluto and its moons “fit in” with the other objects in the solar system, such as the inner rocky planets (Earth, Mars, Venus and Mercury) and the outer gas giants (Jupiter, Saturn, Uranus and Neptune). Pluto and its largest moon, Charon, belong to a third category known as “ice dwarfs.” They have solid surfaces but, unlike the terrestrial planets, a significant portion of their mass is icy material. Using Hubble Space Telescope images, New Horizons team members have discovered four previously unknown moons of Pluto: Nix, Hydra, Styx and Kerberos. A close-up look at these worlds from a spacecraft promises to tell an incredible story about the origins and outskirts of our solar system. New Horizons is exploring – for the first time – how ice dwarf planets like Pluto and Kuiper Belt bodies have evolved over time. The United States has been the first nation to reach every planet from Mercury to Neptune with a space probe. New Horizons is allowing the U.S. to complete the initial reconnaissance of the solar system. The Johns Hopkins University Applied Physics Laboratory (APL) in Laurel, Maryland, designed, built, and operates the New Horizons spacecraft and manages the mission for NASA’s Science Mission Directorate. The National Aeronautics and Space Administration (NASA) is the agency of the United States government that is responsible for the nation’s civilian space program and for aeronautics and aerospace research.